There are a lot of fundamental cooking skills that I believe everyone needs to master. And unless you’re a vegan, vegetarian, or in any other way opposed to beef, cooking a great steak is one of those skills. When I say “cooking a great steak” I’m not talking about just cooking a steak. I’m talking about a great steak. The kind of steak you pay big bucks for at a restaurant and realize it’s worth every last penny. The kind you think only professional chefs can make at fancy eating establishments. And we’re not grilling or using the oven or pulling out any tricks. 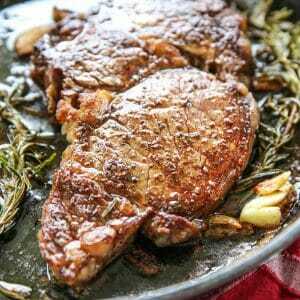 I’m sharing my recipe for a simple, glorious, marbly, beefy steak cooked on the stove top in just a few minutes. If you ask me, this is the perfect thing to impress anyone on Valentine’s Day! So order your kids that heart-shaped pizza and sizzle up a steak for you and your honey. 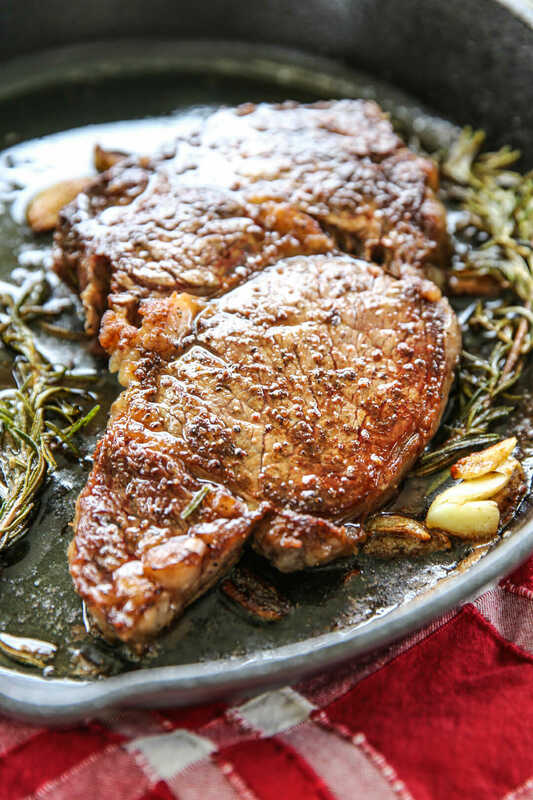 I shared this recipe with our meal plan members last summer for Father’s day so I actually don’t have any process pictures, but you can sit here and stare at that gorgeous piece of finished meat. This recipe is for 1 large steak, but keep in mind that a large ribeye or t-bone can easily serve 2-3 people, or alternately, you could cook a couple smaller steaks in the same pan. 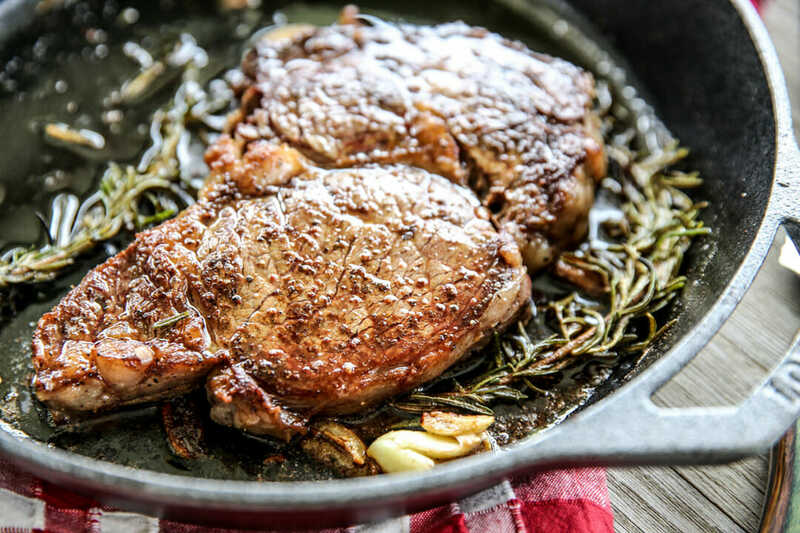 For a good skillet steak like this I prefer ribeye, but if you want something a bit leaner you could go with a New York Strip. 1. Use a cast-iron pan. It’s amazing for heat retention, caramelizes all those little flavor bits and simply works best. 2. Use kosher salt. If you’re not accustomed to using kosher salt in your daily cooking, now’s the time to grab a box. It’s cheap, and found right by the table salt in the grocery store. 3. Don’t even think about using anything but real butter and extra virgin olive oil (I LOVE our Rosemary olive oil here). This isn’t a time to try and cut calories or argue that margarine is the same thing. When you only have a handful of ingredients in a recipe, they’ve all got to be good. 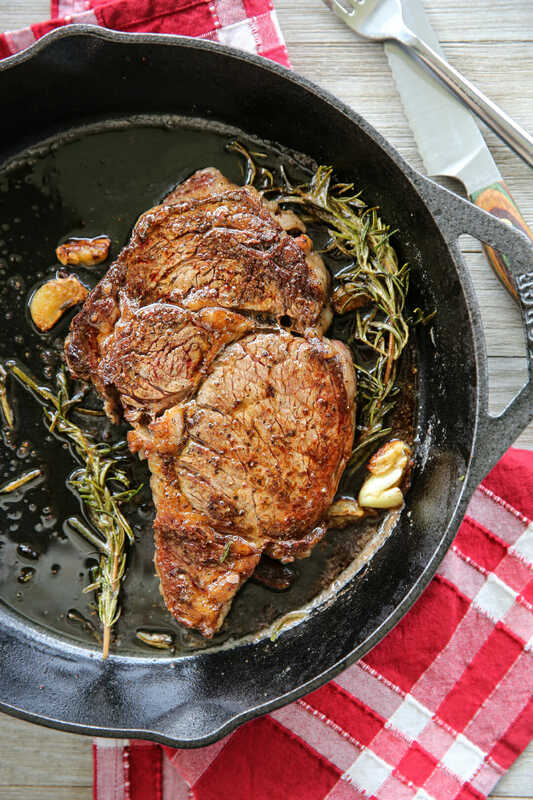 Basically this steak sizzles away and while it does, you tilt the pan and spoon melted butter that’s been cooked with garlic and rosemary all over it. Over and over until it’s at the perfect temperature. And then you eat that steak and and marvel over every last bite that you made one of the best steaks in the world. The perfect steak. Enough said. Set steak at room temperature and pat dry with paper towels. Sprinkle both sides with kosher salt and let sit for 15-30 minutes. When ready to cook, heat a 12-inch cast iron pan on the stove top to medium/medium-high heat. Add olive oil and tilt pan so oil covers surface. It should be hot and shimmery. Blot steak once again on both sides with paper towels and then sprinkle liberally with black pepper, and lightly with a little more kosher salt. Place steak in pan and sear for about 2 minutes, then flip and sear other side. After flipping the first time, add the butter to the pan and add in the rosemary and garlic. Reduce heat to medium, or medium low if necessary (butter should still sizzle and foam, but not burn). Use a spoon to spoon up butter and ladle over steak (carefully use a potholder or towel to handle pan, tipping if necessary to spoon butter). Continue basting in butter, flipping occasionally so you are basting both sides, until steak reaches an internal temperature of 130-135 for rare, 135-140 for medium rare. We recommend you do not cook past 150 degrees. Remove steak from pan and place on cutting board, tented with foil. Let rest 5 minutes and then serve with pan sauce spooned over the top. Any suggestions for those of us with glass top stoves? Do you mean a replacement for a cast iron skillet? Any other heavy-bottomed skillet will work. This is probably a dumb question, but I’ve never understood “tented with foil”. Do you just put a piece of foil over it but don’t wrap it around? Please describe for my confused self! Not a dumb question! Yes, it just means cover with foil but no need to seal up tight. Just lightly cover so it keeps the heat in. This sounds/looks delicious. Are there any alternate ways to accomplish the same perfection for those of us who do not have a cast iron skillet? I usually use a “steak seasoning”. I want to try this…..however, I am not a fan of rosemary at all. I do like garlic and could just use it alone. I wanted to ask, though, do you have any other flavor suggestions/substitutions? Lime? Kale? You could use another herb, thyme springs are wonderful, too! Whatever you do, don’t use kale, haha. Hosting guests on Friday and wanted to test the recipe before… So good!!! Can’t wait to make for guests! can you give time estimates for cooking? I don’t know how to judge the internal temperature. and don’t have a thermometer. if I did wouldn’t know how to use it in the middle of cooking, how do you do that? Hey! If you don’t have a digital thermometer, the best way to gauge done-ness is by touch! Scroll through this post to see the hand test! Oh my GOSH. This was seriously the best steak I have ever had in my life. AMAZING!! !